Vintage Seiko 6139 and 6138 chronographs hold a special place in the world of watches, and in the hearts of collectors. You’d be hard pressed to find another series of watches so well regarded for their quality and style, that are also so easy to own. That’s not to mention also so historically significant, with the 6139 vying for the title of world’s first automatic chronograph. With starting prices coming in at only a few hundred bucks, they are perhaps the best entry point into vintage collecting. And with the sheer amount of models out there, it’s easy to find one that will suit your specific tastes, making them not another “me too” watch. We’ve gone into detail on these guys before. Specifically, I wrote about my own first 6139 purchase, the 6139-7010, a couple of years ago. Then Sean told us about the black and gold 6138-8039 “John Player Special” in one of his Watches and F1 pieces. 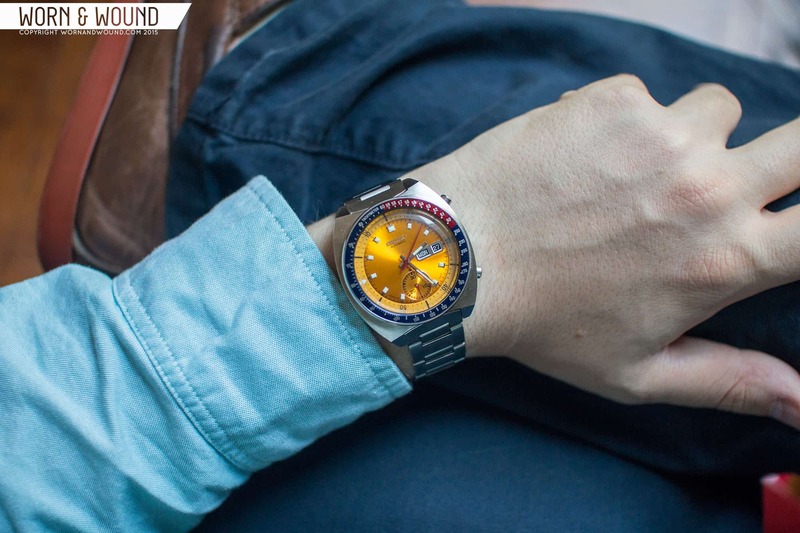 Since then, 6139’s and 6138’s have popped up with some regularity in our guides and conversations about favorite watches. Today we’re going to take a visual tour of perhaps the most iconic of these watches, the Seiko 6139-6002, a.k.a. the Pogue. This watch has been covered pretty extensively on other major publications as well as many forums, but we’re going to take a quick shot at it because we had the opportunity to shoot a basically NOS model with original box, lent to us by our friends at 10:25 Vintage (sorry, it’s already sold). You rarely get to see them in this shape, so we couldn’t pass up the opportunity. This colorful, barrel shaped beauty earned a special rank amongst 6139’s by having been worn by Colonel William Pogue in space on the 1973 Skylab 4 mission. This earned it the posthumously rewarded rank of first automatic chronograph in space. Anything that goes to space is immediately a few points cooler than its earth bound counterparts, but part of what makes this particular story so great is that Col. Pogue took it up without authorization, wearing it on his left wrist, while sporting his NASA approved Speedy on his right. Story aside, these watches are genuinely gorgeous and pretty innovative. The mix of colors from the Pepsi bezel to the golden sun ray dial is surprisingly attractive. I’m not one for much color on my watch dials, but the Pogue just works. It’s refreshing and tasteful, playing off of the blue and red in the tachymeter. The case is a barrel in true Seiko style, with strange lines that curve in towards the dial, and sharp facets on the lugs. There were many cases used on 6139’s, and this is perhaps the most distinctive. On the original H-link bracelet, it comes together to be one of the coolest chronographs ever made. One design feature that I think was remarkably ahead of its time, was the multi-function crown. Amazingly, the Pogue, and its blue and silver dialed brothers, featured rotating internal bezels. That’s cool off the bat for a chrono, but it’s the fact that the main crown doubles as the bezel crown that amazes me. When the crown, which you might notice is flush with the side, is in normal position, it can be rotated to turn the bezel. You then push it in 2-stops to change the day, 1-stop to change the date, and pull it out one stop to change the time… This watch is from the 70’s! No brand does anything like that today, and if they did you know they think they are the most innovative brand on the planet. Well… Seiko, 70’s, been there, done that. Now, as far as watches go, these are pretty common, but the one here is truly remarkable for its condition. The down side of Seiko Pogues, and let this be a warning to you if you want to run out and find one, is that like many other Seiko’s (and vintage watches for that matter) they have been hacked up and reassembled with incorrect or replacement parts. Depending on what you are paying and your goal for owning the watch (i.e. just to wear and enjoy, or to hold and resell), an aesthetically accurate replacement part isn’t a deal breaker. An inaccurate part however should be avoided. And in both cases, the price should be right. Pogues range from a couple of hundred to over $1,000 for great condition. Here is an excellent forum from WUS with many links that can help you on your hunt. With that said, enjoy the pictures of this near perfect Pogue!